The Season 3 finale of The Flash airs tonight (May 23) at 8PM ET/PT on The CW. The season finale is called “Finish Line” and The CW has now released a preview clip! You can find that below. Also of interest to Flash fans: Official stills from the season finale can be found here! 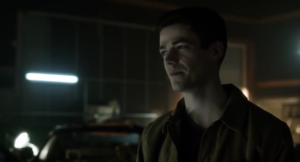 If you’d like to talk about the season finale with other fans, including during the moments it’s on, visit our Flash discussion forum. Previous: The Flash Season 4 Synopsis: Iris Is Alive?! ?